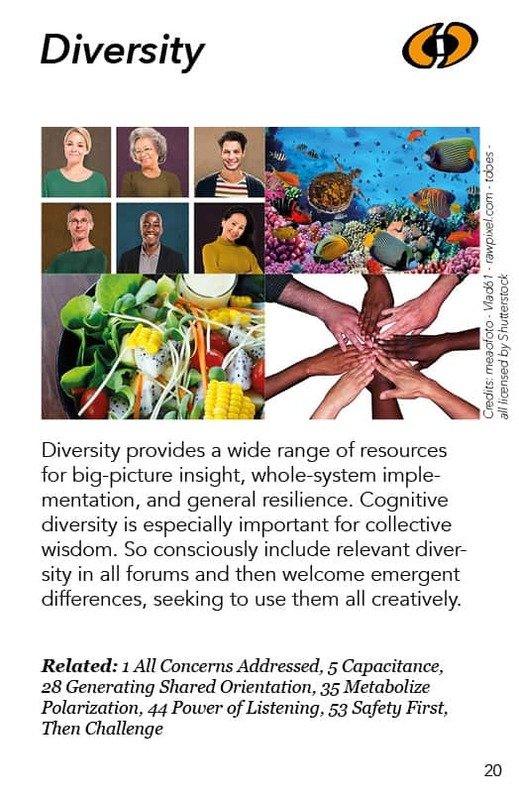 Diversity provides a wide range of resources for big-picture insight, whole-system implementation, and general resilience. Cognitive diversity is especially important for collective wisdom. So consciously include relevant diversity in all forums and then welcome emergent differences, seeking to use them all creatively. Diversity is a resource for many things, three of which are featured in this pattern description. The first involves how we can involve people in getting decisions carried out or at least not resisting them. In democratic theory this is called “legitimacy” – the willingness of a population to go along with a decision, a leader, or a governmental system. In everyday life, we call it “buy-in”. In this pattern we’ve called it “whole-system implementation” because we’re trying to get everyone in the whole system to participate in making it happen. It really helps if people can see “people like themselves” in the decision-making group. This involves making sure there’s demographic diversity. If a decision is totally being made by white guys, for example (as is often the case), then the women and the black or non-white people will be less interested in helping out: There is less buy-in for whatever the white guys come with. On the other hand, if non-white people and women are involved in making the decision, those other folks have a sense of legitimacy about it. If I see my kind of person involved in a decision, I feel it has more legitimacy than when I don’t see my kind of person involved. The same thing goes for the presence of stakeholders in a decision-making or conflict-resolution process. You want to involve a full range of stakeholders – that is, the people involved with the issue, the people who are fighting it out, along with the people who have relevant power or knowledge to bring to the table. To the extent you get all those interests and resources involved in the process, they will carry out whatever decision comes out of the process. The whole system will be involved in making it happen rather than just one piece of the system trying to push it on the rest of the system. The more diversity you bring to the process, the more buy-in you have to actually implement the result. Another big reason to feature diversity is general resilience: If you are raising 30 different kinds of corn and some blight comes along that wipes out one of your varieties, you still have all these other corn varieties left. If you don’t have that diversity, then the blight will wipe out all your corn and you won’t have any varieties as a back-up. This is happening to bananas now. There is hardly any diversity among bananas. They have been bred down to a few of the most productive and enjoyable forms of banana. If something comes along and wipes out those few varieties, we would no longer have bananas. What may be most important for generating collective wisdom is human diversity. 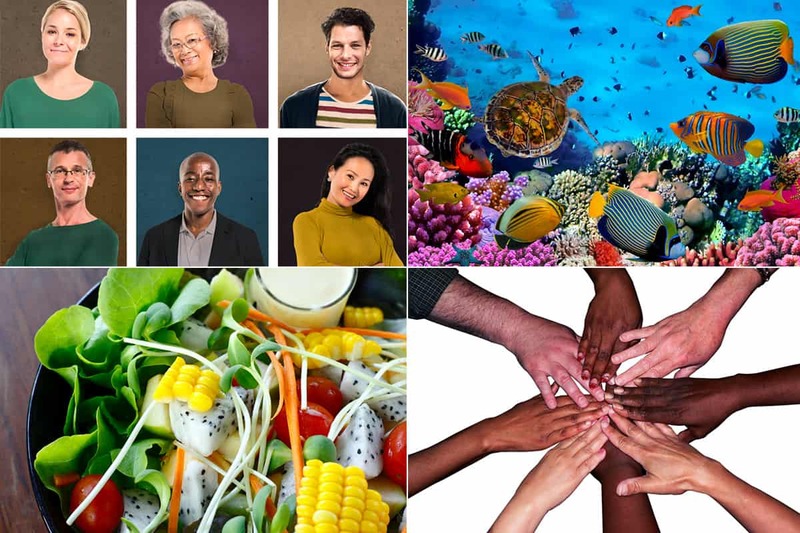 If we have good diversity among people who are deliberating an issue – and if we use that diversity well – we have a better chance of generating big-picture insights from all the pieces of the puzzle that those people bring. If we have only intellectuals, for example, we may well not get anything done. On the other hand, if we have only workers we may have things done but nothing may change because those folks may not have thought things through broadly enough or things may hit them that they didn’t realize were there. If we can combine the intellectuals with their big systems understandings and the workers with their sense of on-the-ground realities, we would get a broader understanding. So the more diversity we can involve in making our decisions, the better the chances we will have the kind of people we need in order to foresee and deal with whatever may hit us. Then there’s the issue of what we’re calling here “emergent differences” – differences that show up in the midst of a conversation: When 2, 3, 100 or 1000 people are talking – even if they all look like they all think alike at the beginning – it usually turns out there are lots of disagreements. Often we marry a person whom we think is so much like us and then – oh my! – all the differences show up. So we need to be able to welcome the emergent differences and then use them creatively, too. This is as important as gathering diverse people right at the beginning. Finally, I want to note that although the word “diversity” has broadly come to mean differences like race, gender, class, culture, sexual orientation, etc., there’s far more forms of human diversity than those. It is tragic that we use these differences as fundamental identities we then oppress people with – and even more tragic that many of them (especially race) don’t have much basis in biological fact and look less and less solid the closer we look at them. Furthermore, people within any of those supposed classes are more different from each other than they are – as a class – different from people in the groups they are supposedly so different from. Most importantly for us here, those demographic, oppression-related differences are less fundamentally relevant for our capacity to generate collective intelligence and wisdom than other differences like cognitive diversity or differences in perspective and ability to collaborate. Of course we must attend to the charged demographic diversity – for some of the reasons noted above but also because society has made them real and they have profound impact on the way people see things (including themselves and others) and the experiences they’ve had. But we need to not lose sight of their intrinsic relativity and the importance of other forms of diversity. They tried to get a dress code instituted to regulate the march. But it wasn’t very popular. Some key people on the march who were engineers keeping all our vehicles running – big manly guys – borrowed dresses from their girlfriends and walked cross-dressed in solidarity with this skinny little gay guy. The conservative people were going out of their minds about this!! What ended up happening was that we organized a bunch of Native American-style talking circles to help people talk about the issue and listen to each other. The circles were convened at a particular stop where some people from the surrounding community joined us. In one particular circle people said some very unexpected things. For example, there was a punk anarchist peace marcher who was (ironically!) a member of the march’s governing board. In the circle he said: “This is really important and we really should be more conscious of our appearance“. Yet he himself had a Mohawk hair style and rings in his ear (which was pretty unusual in the mid-1980s!). Later in the circle a local woman – who was dressed to kill – said: “My mother told me you are all a bunch of communists and should all go back to Russia. But I came here to learn about nuclear war and I find you guys all talking about clothes!“ A bunch of other unexpected comments like that were shared in that circle. Anyway, out of that circle came the decision that when a church or school asked us to have some marchers come out to talk to them about nuclear disarmament, we’d send one punk and one conservative marcher, and they’d say to the audience “We have nothing in common except we don´t want the world to blow up.” That certainly made an impression on people. So the way we used our diversity in this powerful way is a great example of the diversity pattern. Finally I want to highlight a particularly important form of diversity. Professor Helene Landemore of Yale talks about “cognitive diversity” and gives some interesting examples in her book DEMOCRATIC REASON: POLITICS, COLLECTIVE INTELLIGENCE, AND THE RULE OF THE MANY. For example, she shares a story about how the cognitive diversity of one group – which contained regular citizens, police, an engineer, and an accountant, among others – managed to find a solution that diminished crime in a Connecticut area. The solutions they came up with and discarded – becoming ever more creative together as time went on – revealed the value of all of them being involved. They all had very different approaches to addressing the problem, approaches that proved extremely important. She also discusses the movie “Twelve Angry Men“ which can be viewed as one courageous juror who stood out and changed everybody else’s way of thinking about the possible guilt of an accused man. But a closer look at what happens in the movie makes clear that he was also learning from what others were saying. In fact, none of the twelve jurors would have come up with the well-informed decision they came up with after working through their very different and passionate perspectives. There’s more about cognitive diversity in the notes about the Microcosm pattern in this pattern language.